Founded in 2001 as a bottle shop, homebrew supply store and tasting room, Papago Brewing Company has grown into a local landmark, serving 30 beers on tap, plus a full menu of from-scratch foods out of a stylish space inside the Papago Plaza Shopping Center (7107 E. McDowell Rd., 480-425-7439). But due to space constraints, Papago has always outsourced the brewing of its beers to local breweries, including Huss Brewing Co, which has crafted each of Papago’s beers. The craft beer bar and restaurant was not part of the deal and will continue to operate and use the Papago Brewing name under license. As far as long-term goals for the expanding company, the Husses look forward to building a legacy for their daughter, while insuring a healthy and robust company that can compete in the ever increasingly saturated craft beer market. The addition of a new taproom at Uptown Plaza announced last month is just another piece of the plan. “I don’t want to be just another can on the grocery shelf, we’re trying to build something for our family and employees that will last,” said Leah Huss. First Beverage Group is a full-service financial services firm dedicated exclusively to the beverage industry. First Beverage provides a comprehensive range of products, including investment banking and investment funds for growth capital to leading beverage entrepreneurs and operators. Headquartered in Los Angeles with offices in Boston and New York, the First Beverage team is made up of senior executives with over 200 years of beverage industry experience. For more information, please visit the company’s website,www.firstbeveragegroup.com. Husband-and-wife, Jeff and Leah Huss, have over 20 years of combined experience in the brewing industry. Jeff was head brewer for BJ’s Brewing in Chandler, Ariz., for seven years and attended the, Siebel Institute in Chicago, then, the Doemens Academy in Munich, Germany. Leah co-owned and operated Papago Brewing in Scottsdale, Ariz., for 14 years, helping pioneer the craft beer community and growth in Arizona. Their combined love and passion for craft beer inspired them to chase their dreams of owning a local, family-owned and operated brewery with Jeff acting as head-brewer, and Leah running business and marketing operations. In 2015 Huss brought on Arizona craft beer veteran, Chip Mulala, to head up sales and distribution throughout Arizona. Huss Brewing Co. opened its doors in South Tempe in August 2013, with a 30-barrel system, a small tasting room with 20 taps, and room for growth. Since then, they doubled brewing production capacity as one of the fastest growing breweries in the state. 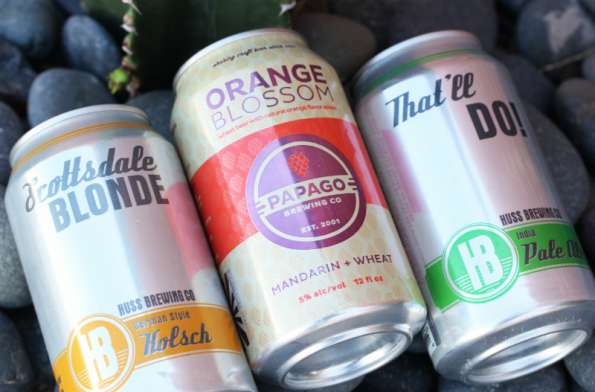 Their fresh, quality, canned beers are canned on site weekly including the brands: Scottsdale Blonde Kolsch, Magic in the Ivy Pale Ale, That’ll Do IPA, Koffee Kolsch, and Husstler Milk Stout.